A good choice of book to reinforce the message that friendship is far better than fighting. It also has a theme of acceptance, and encourages the reader not to judge people on outward appearance. A small boy loves pretending to be a knight and slaying imaginary dragons. 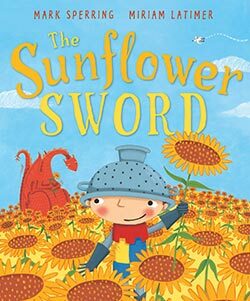 When he asks his mother for a sword, she gives him a sunflower instead. He is disappointed, but ‘whooshes and swooshes’ it about anyway. Suddenly a real fire-breathing dragon appears, and the boy braces himself for a violent battle. To his surprise, the dragon sees the sunflower for what it is and gently reaches out to accept the flower. It seems that the mighty dragon is not so fearsome after all. Word spreads that that enemies can become friends, and all the Knights in the land lay down their swords and offer sunflowers to dragons. The boy’s mother looks on and smiles. Miriam Latimer's illustrations are bold, fun, colourful and appealing.